NEW YORK — The flu season in the U.S. is getting worse. WASHINGTON — President Donald Trump has weighed in on child autism, apparently without a complete grasp of the research. 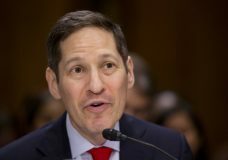 U.S. health officials on Thursday reported the first case in the country of a patient with an infection resistant to all known antibiotics, and expressed grave concern that the superbug could pose serious danger for routine infections if it spreads. ATLANTA — The mosquitoes that can transmit the Zika virus may live in a broader swath of the U.S. than previously thought — but that doesn’t mean they’ll cause disease here, federal health officials said Wednesday. NEW YORK — Doctors, nurses and others fighting Ebola have won Time’s 2014 Person of the Year award, the magazine announced Wednesday. Pope Francis was last year’s winner. OMAHA, Neb. — A surgeon who contracted Ebola in his native Sierra Leone died Monday while being treated in a biocontainment unit at a Nebraska hospital, the facility said. FREETOWN, Sierra Leone — A surgeon working in Sierra Leone has been diagnosed with Ebola and will be flown Saturday to the United States for treatment, officials from Sierra Leone and the United States said.